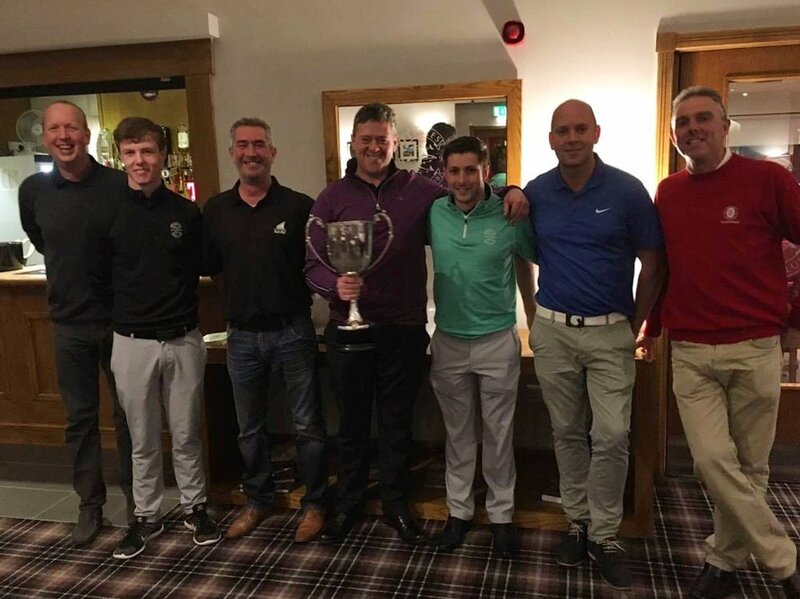 Peebles were celebrating victory in the Borders Summer League after an emphatic win over rivals Torwoodlee at Macdonald Cardrona last Saturday, adding to the title success enjoyed by our Ladies Team the previous week in the Tinto League. A strong Peebles team lined up for the match with Scottish Boys Order of Merit winner Darren Howie returning, partnering Coin Fraser to a win in the morning foursomes. Club champion Jamie Morris teamed up with Allan Turnbull to take another point, while Kris Hopkirk and Steven Waldie earned a half point in their match to move Peebles into a 2.5 – 0.5 lead at the halfway stage. Waldie was matched against Torwoodlee’s number one Simon Fairburn in the top match and he extended Peebles lead with a hard fought win on the last green. Jamie Morris made it two wins, and despite losses from Turnbull and Fraser, Kris Hopkirk and Darren Howie earned comfortable singles win to give Peebles a 6.5 – 2.5 result. Well done to the team, superbly marshalled by non-playing captain Darren Davidson. Peebles Ladies came out on top after a successful 2017 Tinto League campaign, beating West Linton into 2nd place. The other participating clubs were Biggar and Carnwath. Congratulations to all team members. And as if a win in the Borders Summer League wasn’t enough, Darren Howie received a call-up to the play in the Alfred Dunhill Links Championship this week, teeing up alongside the likes of Rory McIlroy, Lee Westwood and Ernie Els, as well as stars from the world of sport and entertainment including Jamie Dornan, Shane Warne, Ian Botham and Jamie Redknapp. Get along to St Andrews, Kingsbarns and Carnoustie to cheer Darren on! Only three ladies entered the Saturday Stableford but relatively new member Susan Nelson scored 38points in the Bronze Division, reducing her handicap by two to 27, an excellent result considering the course is playing very long after all the wet weather. Moira Brown scored 31 points in the Silver Division. This week sees the start of the ladies' Winter League which runs for the next ten weeks. There is a terrific entry this year with 33 ladies taking part. Many thanks again to Val McKean for organising this very successful winter format. The course was in superb condition for Saturday’s stableford, with the greens running smoothly and the sun shining for most of the day. Vic Roberts took full advantage to rack up an impressive 41 points, edging out Simon Dryden to top spot by a single point. A strong back none gave Sam Anderson third place on 38 points, pipping Rab Howie on the better inward half. Earlier in the week, Philip Staples won Wednesday’s Stroke Competition with a nett 68 (14), with Fearghas Lowther in second place on 70 (6). A reminder that this Saturday is the last chance to get your handicap cut or put in that final card, with the Stroke Competition running alongside the Scotsdale Medals Final, as the season’s medal winner battle it out for the prestigious title. Another win for Braden Collins on Sunday as he took top spot in the YMCA Trophy with a nett 70 (33) in tricky conditions. A big thanks to pro Steve Johnston, who took the 18 Steps Group to Cardrona for a 7-hole Texas Scramble and coaching clinic on Sunday as reward for their hard work throughout the season. Well done to the winning trio of Oliver Furness, Fraser Brock and Jack Gordon-Duff. The final ClubGolf coaching session of the season will take place on Sunday 15 October. Congratulations to Steven Waldie who is this year’s Captain’s & Vice-Captain’s championship winner, beating Ian Pemberton by one hole in an excellent final. Well done also to Fearghas Lowther and Scott MacKay who combined to win the Balfour Beatty Four-Ball match play championship, while there was a superb win on Friday night for Norry Forsyth and Simon Dryden in the Ballot Foursomes. Tickets are now on sale for the Men’s Dinner, taking place Saturday 18 November, priced at £30 per person. Guest speaker is refereeing legend Willie Young, one of the best raconteurs on the sporting circuit, and he is joined by former Scottish PGA captain, Campbell Elliot, head pro at Haggs Castle. Tickets are selling fast so make sure you don’t miss out on what promises to be a great evening.